Several years ago we added the ability to restrict the use of mailing lists to a subset of recipients. The intent of this was to allow you to block out anyone who abused the lists without removing their ability to recieve emails sent to the list. This worked well, but it increased the burden of setting up the mailing lists, and in reality abuse of the lists was pretty rare. To make setting up mailing lists easier, we have added a new setting on mailing lists called "open mailing list". 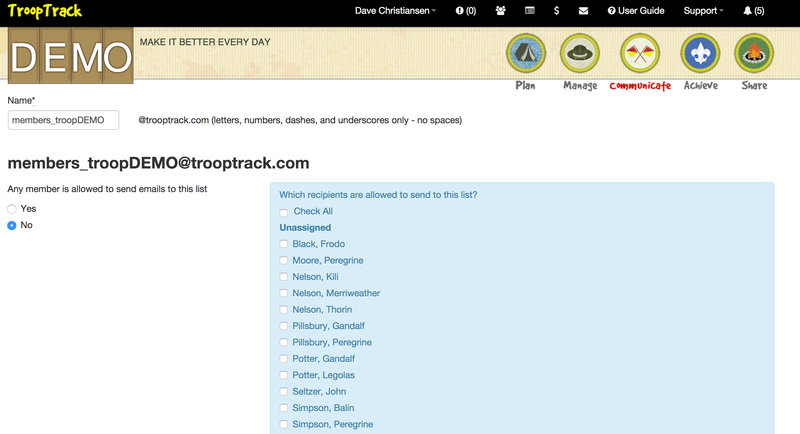 If this is set, then everyone in your troop/pack/service unit can send to the list. If you want to restrict the list, then you set open mailing list to "no" and you can select who can send to the list. This setting also can be used on magic mailing lists. New mailing lists are open by default. If you have the manage sign up sheets privilege you are now able to delete sign up items and to edit and delete all sign up sheets, not just your own. Previously only people with the manage documents privilege could delete photos. This mean a user with the upload photos privilege could upload a photo but could not delete it if they wanted to. As of this morning, members with the upload photos privilege are able to delete photos they uploaded. This only applies to photos uploaded after November 30, 2014. Photos uploaded by that will still need to be deleted by someone with the manage documents privilege.